I was looking at the MM cover today... does anyone know what it means? 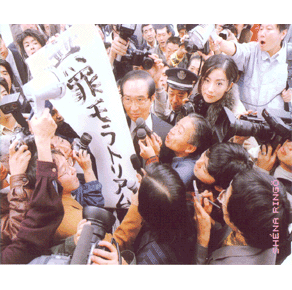 Ringo in a crowd of people surrounding a politician-like guy brandishing a banner with the album's title on it. Kind of an odd image for a debut album, I'm surprised they let her get away with it. Does anyone have any material where she states her intentions about the cover and what she wanted to do with it? Or personal interpretations. What do you think it means? "This album has to do with what my teenage self thought of as “living as a person.” Having naïveté, only to lose it – it always seems like an imperfection, this process you can never get past. That’s the kind of meaning I put into my first album title." Other things I'm noticing about this album now that I've pulled out my copy and am inspecting it: on the front page of the insert is a Marunouchi line, with a Yamanote line intersecting it. Instead of Yamanote stops, there are the tracks of the album (whereas Marunouchi has all its normal stops). This is so freakin' cool I just can't get over it!! I can't believe I never noticed this before. Then on the last page, after all the credits, there is a little paragraph that I believe is a personal message to her fans. Its unfortunate more don't wave the MM flag. Myself included, cuz...well, KZK...but y'know, still! ^ This is my favorite album and it's probably because Morphine is so awesome. It's got a couple of songs that I regularly skip (Onaji Yoru, Shido), but every album is like that for me. I can't name an album I usually listen to straight through. Not even KSK.